Smart grid tie microinverter with its own independent MPPT function, microinverter can be track down the best operating point of PV module at any time, and the MPPT efficiency more than or equal to 99%. 1. With SPLL(soft PLL) automatic power point locking technology, microinverter can be track down the max. power point of PV module and lock at any time. 2. MCU central processing design with independent chip operation for creating SPWM control signal, and run for soft start function. 3. Synchronous signal detection circuit design and high-frequency online grid-connected modulation for AC side, high-frequency synthesis and output sine-wave current which the frequency and phase are same as power grid. 4. With high-performance MOSFET, fast driving and higher performance. 5. Low voltage DC and isolation type booster circuit design for DC side leading to more safe and reliable for use and installation. 6. Anti-islanding setting auto detection, fast reaction, and more complies with grid-connected safe requirement of every countries. 7. With stacked in parallel using technology, microinverters will operate as a large power inverter at any time, more flexible for expansion of PV power system. 8. Fully Protection Functions: Input DC over/under voltage protection, anti-reverse connect protection, output AC over/under frequency protection and over/under voltage protection, short-circuit protection, overheating protection; IP65 waterproof function. 9. Communication operate through RF with data collector, and use with RS323/485 serial port communicate with computer for data collecting and remote monitoring. DC power sources refer to devices which output voltage are match microinverter input voltage setting range as 22-46VDC, included solar panels, batteries, wind generators which DC current operate through AC to DC controller. 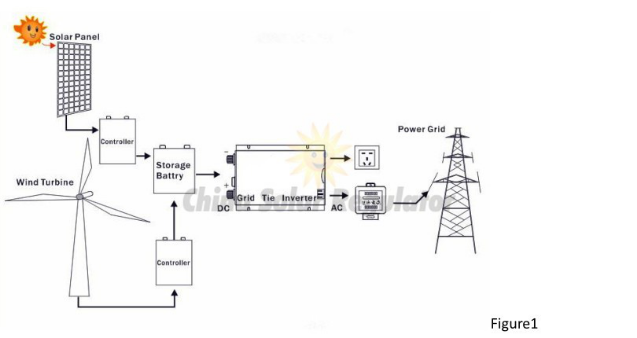 AC power grid refer to single phase utility grid. Such as 110V(90-140V)and 220V(190-260V)single phase electrical utility service. 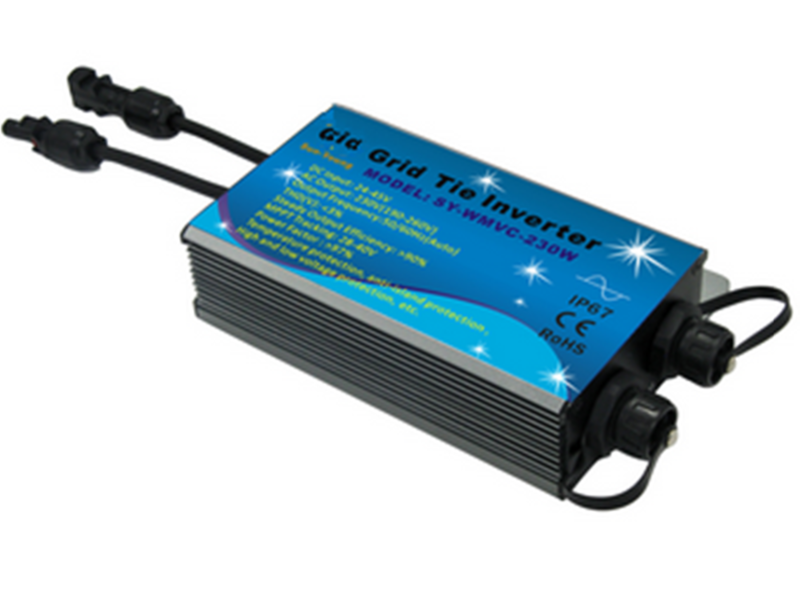 Item information:DC input: 30V 60CellsAC output: 220VPower: 230WSmart grid tie microinverter with it.. 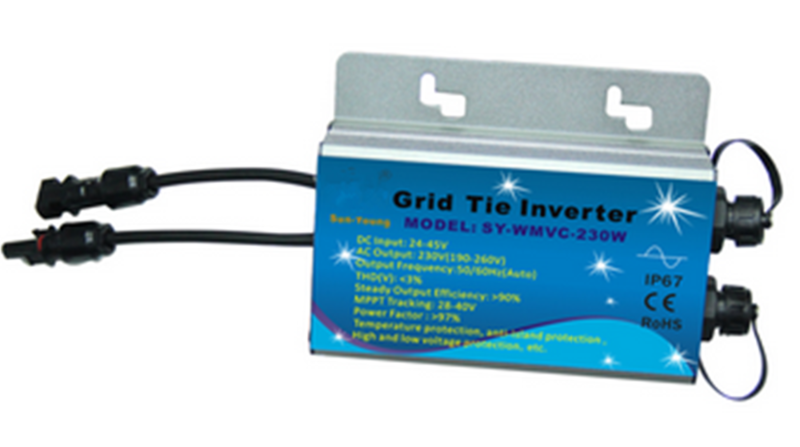 Item information:DC input: 30V 60CellsAC output: 220VPower: 300WSmart grid tie microinverter with it..